Whether you’re just now dipping a toe into the world of wellness (and healthy eating) or have long been a member of the club, chances are you’ve heard about — or have even consumed — flaxseed. You’ve probably run into good ol’ flaxseed in seed-heavy loaves of bread, or maybe even in an oatmeal mix. In original form, flaxseed is tiny, brown and teardrop-shaped, but can be crushed into a flour-like meal or pressed into an oil found in liquid or capsule forms, according to Mayo Clinic. While you may know that its healthy, all this seed actually does for your health may escape you. If so, consider this your guide. Nutrient-rich: First thing’s first, these small seeds are loaded with nutrients — just one tablespoon provides a good amount of protein, fiber and omega-3 fatty acids, in addition to being a rich source of vitamins and minerals. Omega-3s are one of the main reasons that flaxseed is lumped into the “superfood” group. It is a plant-based source of alpha-linolenic acid (ALA), an omega-3 fatty acid that many studies have linked to a lower risk of heart attack, heart disease and stroke, Healthline reports. Antioxidant boost: Flaxseed contains up to 800 times more lignans — plant compounds that have antioxidant and estrogen properties — than other plant foods, which can help lower the risk of cancer and improve health, according to Healthline. But flaxseed oil doesn’t contain these anti-cancer hormones, only the seed does, according to Mayo Clinic. In fact, researchers at Temple University’s Lewis Katz School of Medicine announced on Monday that they discovered a synthetic flaxseed-derived antioxidant (lignan) that improves heart function in mice with sepsis, which alleviates some potential post-sepsis complications. 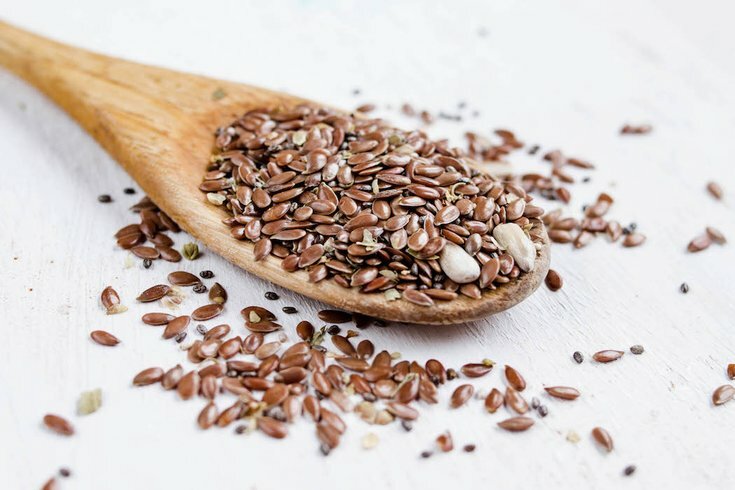 Digestive aid: Flaxseed can help with digestive issues like constipation, thanks to its high-fiber content — which also has the potential to help with weight management. Fiber can help you feel full, after all, according to Everyday Health. Blood sugar stabilization: While more studies need to be completed on this effect, there is some evidence that eating flaxseed can reduce blood sugar levels after a meal and increase insulin levels because of its high content of soluble fiber. Everyday Health reports that it has also been shown to improve insulin sensitivity and, further, might even play a role in the prevention or delayed onset of type 1 diabetes. Plant-based protein powerhouse: With plant-based proteins on the rise as people ditch dairy, flaxseed has become a popular substitute. While one tablespoon of the seed packs slightly more than one gram of protein, when added to protein powder mixes, the count can jump to 35 grams per serving. Not to mention flaxseed protein is rich in the amino acids arginine, aspartic acid and glutamic acid, Healthline reports. Healthy skin and hair: Thanks to those handy ALA fats and essential fatty acids, flaxseed can make hair shinier, stronger and more resistant to damage. Also home to B vitamins, it can help reduce dryness and flakiness of the hair and scalp. The seeds can also improve symptoms of acne, rosacea and eczema. The same benefits also apply to eye health, as flax can help reduce dry eye syndrome due to its lubricating effects, according to Dr. Axe. Hormone-balancing: According to MindBodyGreen, flax and ground flaxseed help the liver complete the process of elimination through the large intestine and decreases transit time of bowel movements, which will help decrease estrogen levels. (In fact, a recent study showed that women who had adequate daily fiber intake had a huge decrease in female cancers). Plus, they add omega-3 fatty acids essential for the skin and hormone balancing. Now that you’re all filled in on what these nutritious seeds can do for you, here’s how to incorporate them into your diet. It’s worth noting that flaxseed is a "health food" and super cheap — ringing in at only $2.29 per pound in the bulk section of Whole Foods — making them very accessible. Of course, you can always simply sprinkle flaxseed or flaxmeal on top of virtually any food, but here are some ways to get them involved in the recipe. Smoothies: This green smoothie recipe adds two to three tablespoons of flaxseed or flaxmeal to a blend of frozen pineapple, fresh spinach, banana, clementines and water. The best part? It covers just about every food group in one quick and easy smoothie. Granola: Granola makes a great breakfast or snack that pairs wonderfully with yogurt, cottage cheese or even milk. This recipe blends healthy ingredients like wheat germ, old-fashioned rolled oats, almonds, and, of course, flaxseed meal with cinnamon, honey, coconut oil, raw honey and an egg white. Not to mention, DIY-ing granola is a much cheaper alternative to buying it in your local health food store. Crackers: If you love a good cracker for all of your scooping, dipping and cheese-carrying needs, you can easily whip up a healthier batch with flaxseed. Create a blend of whole flax seeds and flaxseed meal and combine that with chia seeds, seasonings and water to create a dough which you can then roll out into a thin layer, slice and bake. Egg substitute: While this is used quite commonly in vegan recipes, it might be a hack unknown to the rest of the world. You can combine flaxseed or flaxmeal with water to create an egg yolk-like gel for essentially any recipe that calls for an egg. The general guideline is to use one tablespoon of flaxseed meal and 2.5 tablespoons of water and let it sit for at least five minutes. This substitutes one egg.